Andy Goode struck a last-minute drop goal as London Wasps edged past a battling Exeter Chiefs outfit at Adams Park to cap a day of late drama in the Aviva Premiership. Joe Simpson had twice saved Wasps from a third-straight home defeat when he raced in for a try before denying Exeter fly-half Henry Slade a winning score. Simpson's try helped Wasps overturn a 10-point half-time deficit, before Goode slotted the winning goal in the game's final act. 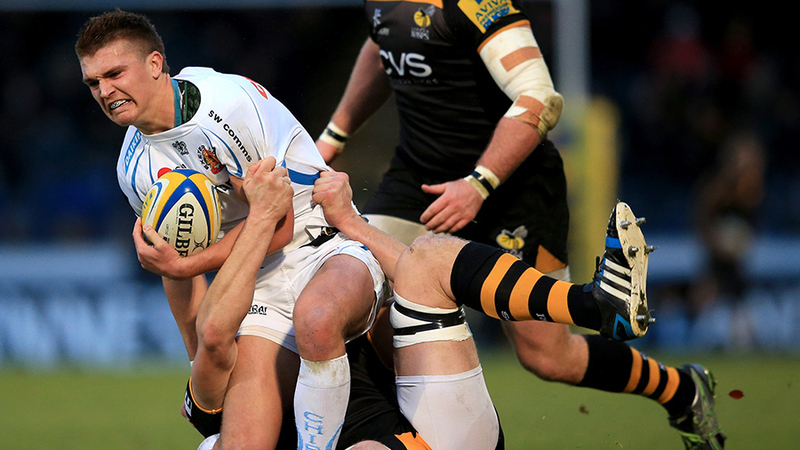 Northampton denied Wasps at the last with 17-15 victory at Adams Park on December 21. Goode ensured there would no repeat, after Simpson and Exeter's Dave Lewis had traded tries. For 40 minutes Exeter hit perfect tactical pitch, nullifying Wasps' burly ball-carrying duo Joe Launchbury and Ashley Johnson. That was when the Chiefs had the wind advantage, though. Without that breeze buffer, Wasps eventually proved Exeter's 13-3 half-time lead insufficient. Exeter blasted out of the blocks thanks to a solid line-out platform and Lewis' quick thinking. The alert scrum-half raced clean through to register the game's first try just two minutes in, punishing Wasps' sloppiness in not posting the ruck. Slade's conversion consolidated Exeter's perfect start, serving in turn to shake Wasps from their slumber. Goode's deflected chip dropped perfectly for centre Chris Bell, whose own hack forward almost followed suit for Varndell. The former England winger could not quite tiptoe the right side of the touchline, so despite collecting and dotting down there was to be no try. No sooner had Exeter cleared their lines than Wasps blasted them off a ruck to claim a kickable penalty. Long-range specialist Daly stepped up, and potted the hosts onto the scoreboard. Slade slotted a penalty of his own with little delay to restore Exeter's seven-point cushion. Wasps were straight back on the attack, only for Goode's cute grubber to come up short, allowing Exeter easy relief. Varndell cut in behind Exeter again, only for Nowell to haul him down just metres shy of the whitewash. Exeter rebuffed a pile-drive short carry from Ashley Johnson, forcing first a Wasps knock on then a penalty from the five-metre scrum. Full-back Daly then coughed up a high ball under scant pressure, and Exeter drove Wasps into conceding a penalty at the scrum. Slade slotted the easy points to extend the Chiefs' lead to 13-3 just past the half hour. Prolific goal-kicker Goode had an immediate penalty chance to slim Wasps' deficit, but the former Leicester and England outside-half failed to convert. His wayward work with the boot continued when he gifted possession to Exeter with another ill-judged grubber. Daly then misjudged Tom James' high ball, with the bounce allowing James to force him into conceding a five-metre scrum to the Chiefs. Referee Dean Richards ordered three re-sets before that five-metre scrum could complete. Exeter's promising No. 8 Dave Ewers had to break under pressure, and Wasps dominated the tackle area again to force a vital turnover. There was a pause in play as Chiefs' tighthead prop Hoani Tui suffered a neck injury scare, carried off by stretcher after lengthy on-field treatment. Tui's injury only added to Exeter's front-row concerns, with experienced loosehead Brett Sturgess already confirmed as out for the season. Promising youngster Alex Brown slotted into place, as the game edged to half-time with Exeter still 13-3 to the good. James then dropped a regulation high ball as Exeter handed Wasps an ideal platform to start the second half but Charlie Hayter could not hold Goode's inside ball after Will Helu's neat break. Wasps did win a scrum penalty though, and Goode duly converted and they should have scored their first try from Hayter's midfield charge but Goode could not find Helu cleanly, forced to settle instead for his second penalty in three minutes. Finally the hosts had their try, though, with Simpson mimicking Lewis' first-half score for Exeter, sneaking round a ruck to race home unimpeded. 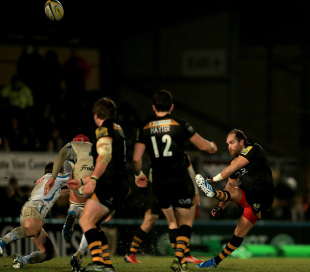 Wasps had the lead for the first time, which Goode's conversion extended to three points. Exeter pressed again, stealing the ball after forcing knock on. Slade raced clear, only for Simpson to deny him a try by twisting him off the ground, television match official Graham Hughes making the call. Exeter sustained the attack with a five-metre scrum, but could not find a way through. Slade did slot a penalty to level the scores at 16-16 however. Not to be denied, however, Wasps hit back, set a platform in the Exeter half, and Goode delivered.